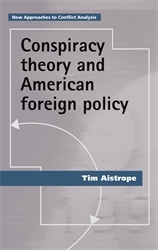 Conspiracy theory and American foreign policy examines the relationship between secrecy, power and interpretation around international political controversy, where foreign policy orthodoxy comes up hard against alternative interpretations. It does so in the context of American foreign policy during the War on Terror, a conflict that was quintessentially covert and conspiratorial. This book adds a new dimension to the debate by examining the ‘Arab-Muslim paranoia narrative’: the view that Arab-Muslim resentment towards America is motivated to some degree by a paranoid perception of American power in the Middle East. This narrative subsequently made its way into numerous US Government policy documents and initiatives advancing a War of Ideas strategy aimed at winning the ‘hearts and minds’ of Arab-Muslims.